Glenn Palmer and his team at Lakewood Hardware led LakewoodAlive's "Knowing Your Home: Hands-On Window Repair" workshop. Repairing a window is not only energy efficient and environmentally friendly, but it also helps to keep the historic look and feel of your wonderfully old home. It’s no wonder a sellout crowd was on hand for LakewoodAlive’s “Knowing Your Home: Hands-On Window Repair” workshop on July 19. 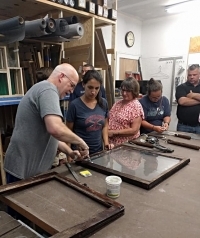 Hosted by our friend Glenn Palmer of Lakewood Hardware, this free workshop featured a hands-on presentation covering how to check window sashes, identify parts of the window and learn simple window repairs such as sash repair, glazing and sash cord repair. Should you observe any preliminary signs of wood-rot along your window’s frame, then it might be worthwhile to apply a wood hardener product. A milky liquid wood hardener that you brush onto the rotted wood can help prolong the lifespan of your old windows. This product works best when it’s applied to dry wood and allowed to absorb for at least 24 hours. For many years, the weight and pulley balance system for double-hung windows has served as the standard in wooden window construction. In this system, a vertically sliding sash is attached to and suspended by lengths of cord or chain. However, it’s important to consider the type cord you use. Whereas a sash cord and chain are advisable for use with window weights, a nylon cord is not recommended. Sash chains are highly durable, though they tend to be noisier when compared to other types of cord. Not yet ready to repair your old drafty windows? You might be in luck. Seal & peel caulking can often be used as a temporary fix, buying you time until you have to pursue a full-fledged repair. Extremely adhesive yet easy to remove, this product is a great weather sealant, and fills gaps easily until you’re ready for a full repair. On older single-pane windows, the glass is usually surrounded by putty called glazing compound, which holds the glass in place and seals out the weather. After decades of wear and tear, this putty typically needs to be replaced. When glazing your windows, make sure to use a putty knife that’s sturdy and non-bending. The right tool can save you from unnecessary headaches while helping you to tighten up drafty old windows. Speaking of window draft, adequate insulation often represents an excellent way to thwart this problem – but proceed with caution. When insulating your sash weight cavities, make sure to use foam insulation that is specific to doors and windows. Foam expands when it dries and you don’t want to use a foam insulation that will over-expand and damage your beautiful old windows or walls. Matt Bixenstine is the Marketing & Development Manager for LakewoodAlive. He enjoys all things Lakewood, especially walking his basset hound through Madison Park.